A few common household products can keep the house clean for a year - for around $20! Not too many prepared cleaning products are used in our home. In fact aside from dishwasher powder and dishwashing detergent, and laundry soaker, everything else is made from ingredients I keep in the cleaning stockpile. 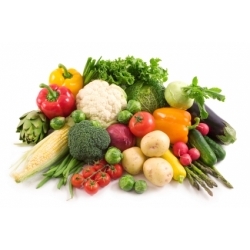 From these ingredients I can keep our whole home clean and fresh, and do all our laundry. Yesterday I made a double batch of Miracle Spray. Wayne used it to clean some mildew off a tent we were given, with great results. It cleaned the mildew stains and didn't bleach the canvas. This morning I filled a dishwasher detergent bottle with water and topped it up with full strength detergent - two bottles of dishwashing detergent for the price of one and it works just as well at half-strength as it does at full strength. As an aside, I noticed on Friday that Aldi have dropped the price of their dishwashing concentrate again - it's down to $1.59 a bottle. Between Christmas and New Year I'll be doing my cleaning stockpile shop to see us through 2018, so a list of what's needed has been started. 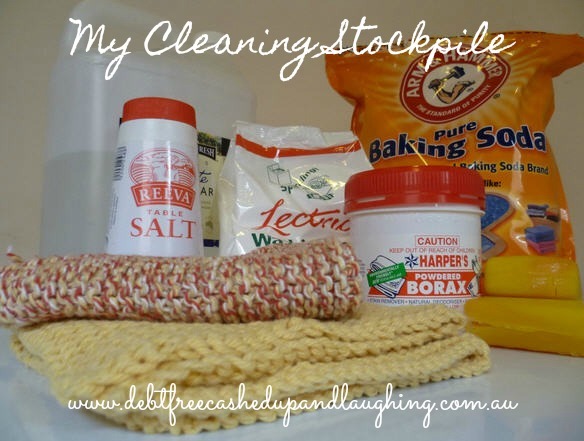 So what's in my cleaning stockpile? Where do I buy cleaning ingredients? Borax and dishwashing detergent come from Aldi (the borax is a special buy - keep an eye open in the catalogue for when it comes on sale as it's around half the price of borax from the supermarket and in a reasonably sized tub). Laundry soap and dishwasher powder come from Coles. They are both generic. You'll find laundry soap in the cleaning aisle, usually on either the very top shelf or the very bottom shelf near the laundry powders. Dishwasher powder is normally on the bottom shelf with the dishwasher powders. Eucalyptus oil and lavender oil I buy direct from Bosistos. They have great sales and this year they had a 4 litre bottle that I was able to share with friends that brought the cost down to $23 a litre - the cheapest price at the time for pure eucalyptus oil. Citric acid and washing soda come in 5kg buckets direct from Aurora Cleaning Supplies. White vinegar I buy at Aldi. Bicarbonate soda can be bought in 5kg bags from Costco. If you don't have a Costco membership then you can buy it from pool shops under the name "ph buffer". Just be prepared to have to buy it in bulk - perhaps you could share it with a couple of friends. What do I make with these ingredients? If you do have a costco membership, I believe the white vinegar is the cheapest around. The 5L bottle of branded "Always Fresh" is under $3. It's always there and in the oils aisle generally.